With a legacy that will last long after he is gone, our pastor, Father John Berg, gave one of his last sermons to our church community at St. Stephen the First Martyr Catholic Church. We know it’s getting close to his August departure so he’s getting in his final words to us – they are the words that most parents would say to their children if they were leaving for a long time, such as when your loved ones leave for college, the military or moving out of state. He’s careful, thoughtful and serious because he can be that way when he knows it’s important, because he recognizes that he is the shepherd of souls. What is important, truly important, usually are those last parting words. Worried that your children have what they need, the necessary tools to stay safe, common sense to see them through their journey, these are the things all good parents are concerned with when they are separated from their children. His words are spiritual because he is a priest who has invested himself into the lives of his parishioners. His words are of caution and admonition. He’s concerned like a father, a friend and a brother. His comportment is always energized and friendly, yet I know he has sacrificed himself like most good parents. He’s been at the bedside of the sick and dying, attending to the deceased and their grieving loved ones. He’s on sick calls and sacrament calls to those who are within and outside our church. 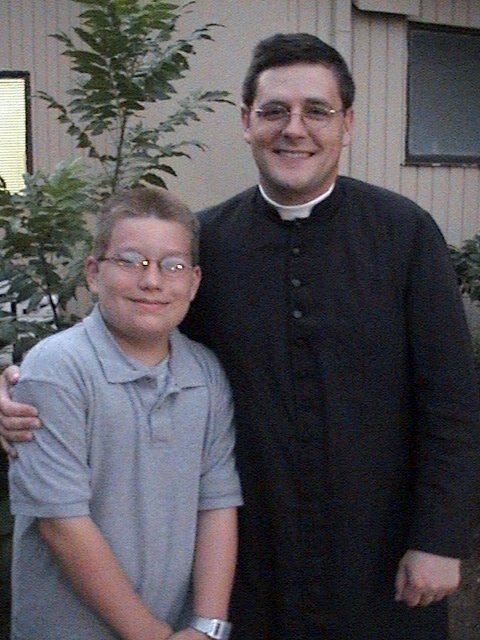 He runs an altar guild of approximately 100 boys, a week long summer camp, a youth group, a girls society of 70, a bustling parish of large Catholic families who have baptisms, weddings and many things that need blessing, such as people, homes, cars, and businesses. He’s blessed our home, shared our meals, holy days and prayed with us. He’s taken our calls late at night, answered our emails, comforted us in our sorrows and instructed us in the faith. He’s present in our sorrows and joys and always seemingly untiring in his zeal, especially with the youth. How does one possibly thank someone such as this, who has poured himself out thusly? When we first joined the community 7 years ago, St. Stephens was not in existence. It was a community of families who had an attachment to the classical liturgy of the Catholic Church and the traditional devotions. We were leasing space from another church and had no real space of our own to come together and worship. Since Father Berg arrived, we’ve managed to purchase, completely renovate and dedicate our own church. The magnitude of what he has built can only be comprehended in light of the short time he was amongst us. His dedication to the faithful, his constant attention to his duty as a priest, making sure he was steadfast in his duty to his office and to a strong prayer life. There were nights when he’d be late at someone’s home, praying his breviary, making sure that while he was spending time with your family in fun and fellowship, his focus was always on his primary relationship with God and his duty to his prayer life. His example to the children, his contribution to their faith formation, his zeal for God, fortunately, are all legacies he will leave behind to us, like a good parent who has raised his children well. He remarked recently that it will be difficult to leave because he likens his transfer to that of handing over his child, but you would never know that from his exterior, because he is humble. There is a side to him that is completely a boy at heart. You see it when he is out on the field with the boys playing dodge ball or the girls playing volleyball. You see it when he sits down with a group of toddlers to play ‘duck-duck-goose.’ You see it when he meets the men for basketball, the kids for street hockey and the ladies for coffee. He makes himself completely and totally available, that’s if you can get into his appointment book on time because he’s always ‘booked’. He’s a phone call or email away…and not far from your hearts, like a parent, a brother or a good friend. It’s been said he rarely sleeps well or long.